For each course, Tom found an American wine that he hoped would go well with it. You can see his choices and their results as he reported them on his blog. Here are the recipes I used for the meal and the Italian guests’ reactions to them. My first choice for an appetizer had been Maine shrimp, which marvelously sweet-fleshed little beasties are just coming into season. Alas, thousands of other New Yorkers seem to have had the same idea, and six local fish stores didn’t have any left on the day of the dinner party. So I settled for small, deep-water rock shrimp from Florida, which are supposed to taste like lobster. Briefly boiled, they weren’t very lobsterlike, but they were tasty enough with Tom’s spicy cocktail sauce. 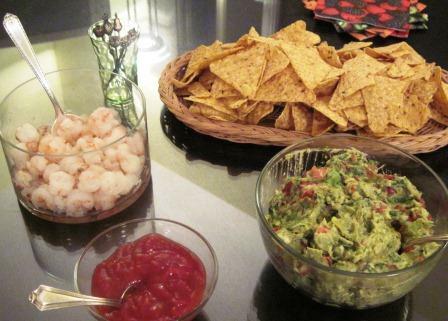 I also made my favorite, classic guacamole recipe from Diana Kennedy’s The Cuisines of Mexico. The Italians had never had guacamole before; they loved it. This recipe came from Heirloom Beans, the Rancho Gordo cookbook. I’ve praised this artisan California bean grower in previous posts, and this recipe reinforced my appreciation. The variety I used is Midnight, a delicious black-purple bean. You sauté onions, carrot, and jalapeño chile in lard; add cooked beans along with ground roasted cumin seed, oregano, cayenne, chicken broth, roasted garlic cloves, and roasted tomato; simmer until everything gets thoroughly acquainted; run some of the beans through a blender or food processor and stir them back into the pot. 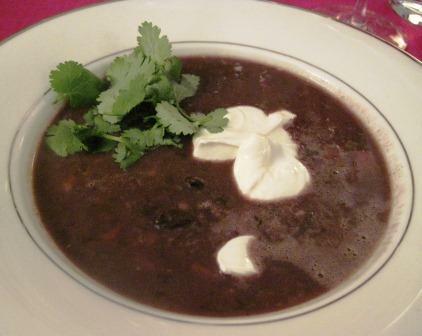 Serve, garnished with sour cream and cilantro. Very spicy, very nice, and very interesting to the Italian guests, who weren’t familiar with black beans. Shad has also just come into season here. These Atlantic-ocean fish don’t go into the Mediterranean, so I thought a small portion as an intermediate course would be an interesting new taste for our friends. And so it was: The distinctive, almost smoky taste of this late-winter specialty seemed to be a real treat for them. I used a very simple preparation from the American Cooking volume of the Time-Life Foods of the World series. Merely melt a lot of butter in a baking dish, add shad fillets, turn them in the butter a few times, and set the dish under a hot broiler for about six minutes. Salt, pepper, and serve with lemon wedges. It was simultaneously rich, lush, and delicate. This recipe is also from the Time-Life American Cooking volume. 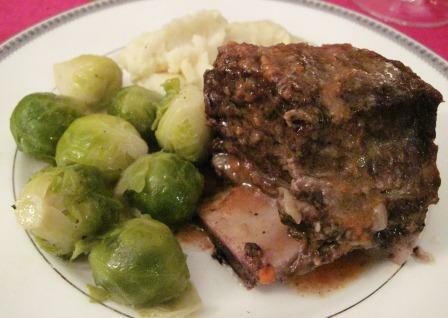 It produces wonderfully rich short ribs with only the most basic additional ingredients. The recipe starts with a very useful trick for browning a large quantity of meat: Flour the pieces lightly, set them on a rack on a large roasting pan, and put them in a 500° oven for 25 minutes. So much easier than hand-turning a few at a time in a pan with butter or oil! Since short ribs are well-marbled cuts, the excess fat simply drops down beneath the rack and keeps the meat from frying. After that, the short ribs are added to a casserole in which you’ve sautéed carrot, onion, garlic, and thyme. A small amount of stock or broth is added, with a bay leaf, and the covered casserole is put into a 325° oven for about an hour. The liquid barely touches the short ribs (I’d really call this a casserole roast, not a braise), but it keeps the meat moist and succulent and emphasizes the meat’s natural beef sweetness. Very large ribs need a bit more time, as ours did. The strained cooking juices make a delicious gravy. 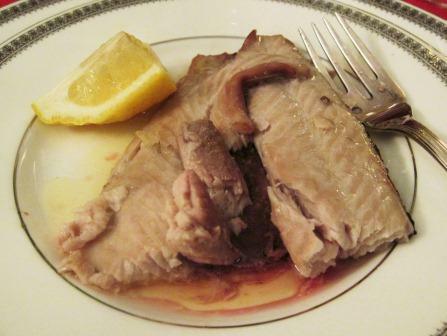 Once the unusual-to-Italians cut was identified (manzo sufficed), it was eaten with gusto. This is my mother’s apple pie. I learned to make it when I was very young, by watching her in the kitchen, and it’s the only dessert I ever make without a recipe. I start with a plain short pastry. I peel, core, and thinly slice about six apples; heap them in the bottom crust; pour on a cinnamon-sugar mixture (I couldn’t tell you how much; I do it by instinct) and a few dots of butter; lay on the top crust and seal the pie in my mother’s style – pressing the crusts together with the tines of a fork. I brush the top with a little cold water and a sprinkling of sugar, and bake it. Depending on how sweet the apples are in themselves and how free a hand I’ve used with the cinnamon-sugar, the pie may come out more or less sweet, but it’s always enjoyable. 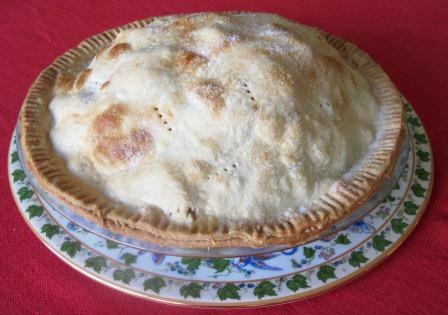 Our Italian friends had never eaten an American apple pie before, and they found its appearance a bit puzzling. It’s like a torta di mele, I told them, and they nodded their heads happily and took another bite. I find browning one of the more tedious/annoying – yet important – parts of cooking meat, so this oven-browning is a great tip. I wonder if something similar would work for smaller pieces, as for a stew? I should think it would, Hope. Less time in the oven, of course. The other evening I browned sections of veal shank for osso buco that way, and it worked fine. In both cases I discovered that you really have to shake the flour off well, or else it crusts on the meat more than you want it to. I’ve had success with rock shrimp by saute-ing them very-very briefly in a very hot pan with olive oil and garlic (of course) and occ a dried hot pepper or a touch of smoked Spanish paprika. If you crowd the pan, they steam so I sometimes do them in batches. The Maine shrimp season for the year has just been closed (there is a catch quota) and I missed most of it! Victor, when I saw your comment I went immediately out to my fish store in hopes of snagging their last pound or two. No luck! It seemed like a very short season this year, darn it.